Chennai Super Kings (CSK) registered a thrilling victory over Rajasthan Royals (RR) in their Thursday night’s contest in the VIVO Indian Premier League (IPL) 2019. Kiwi all-rounder Mitchell Santner hit a six off the last ball to finish the game off in style. But this match will be remembered for CSK skipper Mahendra Singh Dhoni’s outburst. The former Indian captain who is known for his calm demeanour lost his cool towards the game, and his never-scene-before avatar sparked meme-fest on social media. Yes, there’s a new meme in the market this IPL 2019 season, and it has nothing to do with Royal Challengers Bangalore (RCB) and its captain Virat Kohli (to an extent). Get ready to check out ‘Angry MS Dhoni memes’ that are as funny as RCB memes. RCB Memes Apart, Now Virat Kohli Receives Negative Comments on His Latest Instagram Post Ahead of KXIP vs RCB IPL 2019 Match! Fans are used to Virat Kohli losing his temper on the field. The present Indian cricket captain has a fiery, go-for-the kill and flamboyant personality. In fact, in this edition of IPL, Kohli reportedly lashed out at match referee after Bangalore’s match against Mumbai Indians (MI) over a wrong no-ball call. So, fans are aware of Kohli’s anger and kind of accepted it. But MS Dhoni is someone you do not see losing his calm, especially on match officials. And this is what happened in the 25th match of Indian Premier League. New RCB Meme Shows Anushka Sharma Wearing Chennai Super Kings Jersey and an Upset Virat Kohli! View Pics. Towards the end of RR vs CSK match at Sawai Mansingh Stadium, Dhoni lost his cool and was seen chastising an umpire. It so happened Chennai were chasing a modest total of 152 runs, which went down to the last over. Dhoni scored 58 off 43 balls before RR’s Ben Stokes got him out with a yorker in the last over. The skipper however uncharacteristically lost his cool when a waist-high no-ball to Mitchell Santner was ruled out by umpire Ulhas Gandhe after trying to raise his arm. It infuriated Dhoni so much that he stormed inside the ground to lash out at the umpire, before leg umpire Bruce Oxenford asked him to calm down and sent him back. 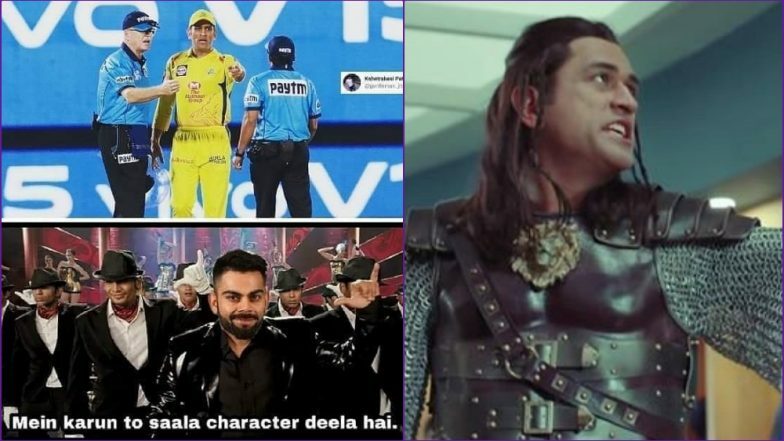 Dhoni’s dramatic reaction attracted 50 percent match fine, flak from former players and a whole bunch of memes that we will check out now. Even Captain Cool loses his Cool..!!! Interestingly, win over Rajasthan Royals was 100th IPL win for MS Dhoni. Chennai Super Kings are on top of the IPL 2019 points table with six wins out of seven matches. They will be next playing Kolkata Knight Riders (KKR) at Eden Gardens on April 14, Sunday. As for the original champions of memes aka RCB, they will play Kings XI Punjab at Punjab Cricket Association Stadium on April 13, Saturday, hoping to win their first match of the season.